Animals are always a popular subject at our house and the cold, cold winter we’ve been having has made this the perfect time to learn about Arctic animals. We learned fun facts about puffins, Arctic foxes, and reread one of our favorite books, The Three Snow Bears. 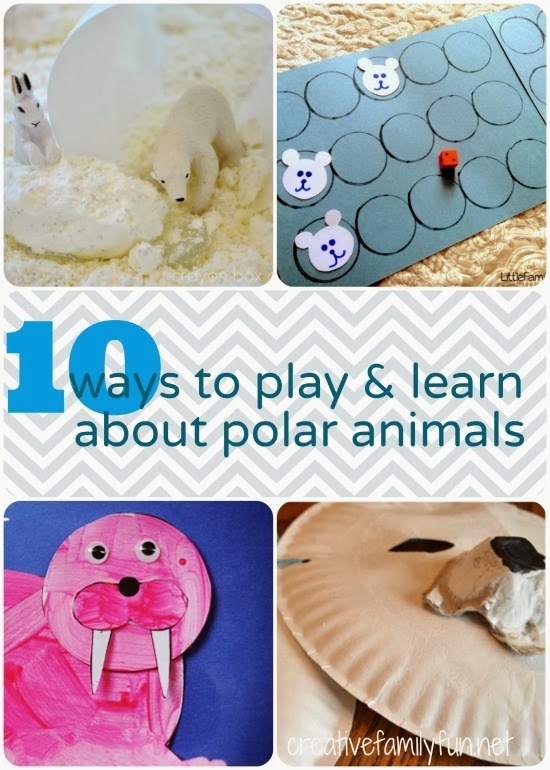 Here are 10 more fun activities all about polar animals. Do a little polar bear science and find out how a bear with black skin looks so white with this experiment at Sugar Aunts. Make simple paper plate polar bear masks with Creative Family Fun. Do an experiment to find out how blubber keeps whales warm at Frugal Fun for Boys. Play with an Arctic snow dough small world sensory bin with Crayon Box Chronicles. Create sponge-printed penguins with Teach Preschool. Do a little math and compare the sizes of Arctic animals with Gift of Curiosity. Play in an Arctic ice sensory bin with No Time for Flashcards. Play a fun gross motor polar bear game with Sugar Aunts.